How much time do you actually spend holding your iPad? If you are like me, you probably put it down when watching Netflix or listening to a podcast. Not to mention the fact that you can use your iPad hands-free while plugged in through Siri. All you have to do is say “Hey Siri” and she’ll respond – if your iPad is new enough and you switch on the option that is. Yes, you can use your smart cover to prop up your iPad, but that’s a solution for coffee shops and other away-from-home places. You owe yourself something more stylish where you hang your hat. I’ve brought together some of the most popular stand choices you can buy online today. I’ve put my favorites at the top and the rest are just sort of in no order at all. What’s cooking? You, if CTA is to be believed. This is one of the smartest ideas for an iPad stand I’ve ever seen. This is a wall-mount and a desktop stand all in one. 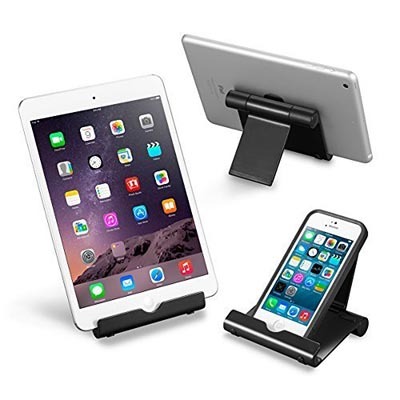 You get two wall mounting bases and a stand that has feet folding together to fit into them. You can have one in the kitchen and one in, I’m guessing here, the bathroom, and use the stand when you are at your desk or anywhere else. 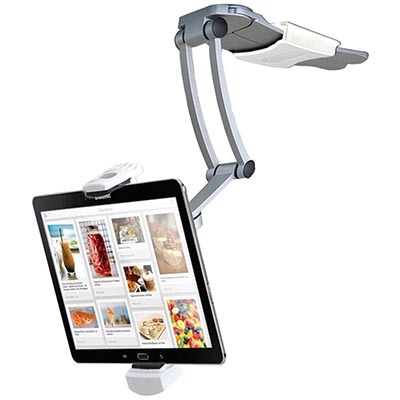 It can be adjusted 360 degrees and at various angles, thanks to the arm mount design. I can actually see myself using this on a daily basis and this sort of simple innovation really appeals to me. The price is also right; if you ask me, I would have expected to pay more than a few tens for something like this. This blows me away, since I have seen what mounting systems like this cost in the PC space when looking to VESA mount a screen. I think CTA could have doubled the price and still this would be worth it. It is not often that I say that. 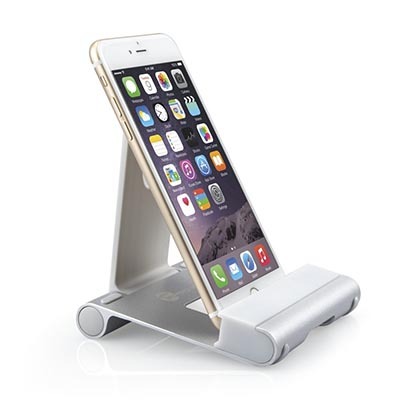 They also have a version of this stand that comes with a Bluetooth speaker; how neat is that? Man, the more I encounter Anker’s stuff the more I like it. It’s really now becoming a brand recognition thing and just a little while ago I had no idea who they were. Anyway, this very sensible looking aluminum stand comes in either silver or black. It isn’t all in one solid piece that’s been bent into shape – oh no, it has clever hinge bits, which is why it costs a buck or two more than some of the other stands which one person hilariously described as “Made by Orcs”. Sticking with the Lord of the Rings theme, this stand from Anker may not look like Orc handiwork, but it isn’t elf-made either. No, this is clearly the work of the dwarfen folk who give a bit more attention to function and don’t mince around in tiaras. The stand is rated at 11 lbs of load, which is clearly in excess of what any Apple device (or five) will ever weigh, so Anker is just showing off, basically. 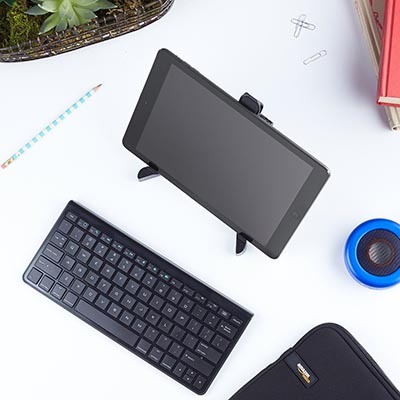 The best thing about this stand is the fact that you can adjust the angle of the tablet’s screen, which means you can use it more like a laptop and get the right viewing angle relative to your position. It looks good, it has an 18 month warranty, and the price is at the impulse buy level. This stand may very well be going into my daily driver bag sooner rather than later. Well, here is some truth in advertising. This is just about the squarest stand I have ever seen. I almost don’t want to bring it close to the gentle curves of my iPad. It’s also very expensive, but as you’ll see this is not actually a stand meant for regular users like most of us. This is actually a stand that turns an iPad into a point of sale system. It provides power to the iPad and by using the Square app you can use the built-in credit card reader to ring up transactions. This is pretty cool for a small business or mobile business that has to go sell things at events and such. 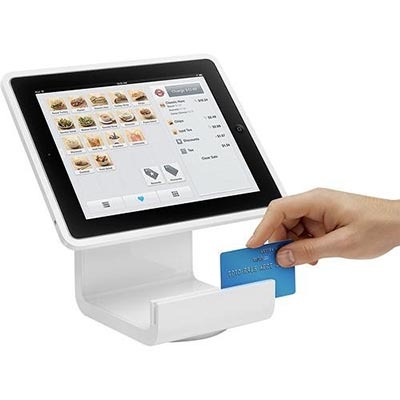 The stand lets you connect cash registers, barcode scanners, receipt printers, and any other similar device that will work over USB. I have to commend Square for a solid design with lots of features. Too bad you can’t use that card reader as a faster way to do online shopping. 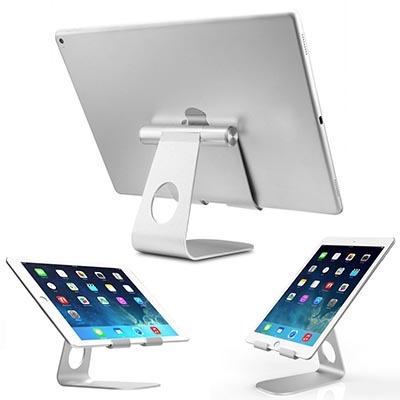 This no-name iPad stand has a gimmick that I like. 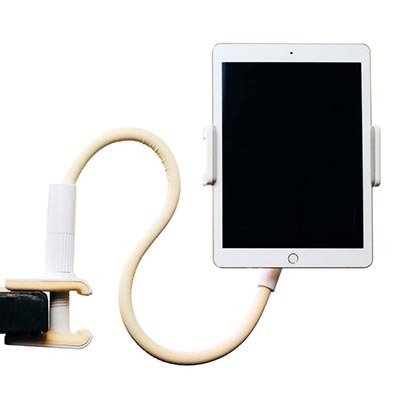 You can clamp mount it to any desk or other similar thing and use the gooseneck arm to adjust your iPad in any way you want. I can think of all kinds of places I would want to use this. It looks flimsy in the photos, but the materials say that it will take as much as a 12” iPad Pro. Some people are reporting that the end of the gooseneck won’t stay in position under the weight of the Pro. This is a stand with 101 uses and a good price. The materials seems to be of good quality and there aren’t any apparent build-quality problems. All in all, I’m glad someone brought something like this to the market. Now, where is that “add to cart” button? The Ecandy definitely has that Apple aesthetic nailed down – especially in silver. Speaking of which, the Ecandy comes in a number of colors, some of which remind me of old iPod shuffle shades. The compatible list for Apple devices is long and includes everything from the iPad 2 and up and the iPhone 3GS and up. Although in the case of the iPhones it is sort of redundant. It’s a phone; you can stand it up against just about anything. The only thing that worries me is that it seems to be designed for phones first and is a bit small for a tablet. Users report that tablets sit fine in landscape, which is where most of us will use it, but portrait mode is too top-heavy. Which means you can’t make use of the charger cable punch out. There are also complaints of bad build-quality. It’s stylish and well-priced, but maybe as an iPad owner you should look elsewhere. Usually AmazonBasics does a good job of balancing out form, function, and price. This time I think they have dropped the ball in the form category. This stand is totally functional and totally cheap, but it looks like a nasty discount guitar stand from the early 2000s. If that’s the vibe your weird interior designer suggested, then this is perfect for you. Also, ewww. Still, this little guy does the job well and is backed by the big A itself, so your money could be spent in worse ways. One big upside is that it folds down completely so that it easily fits in your bag. However, the suggestion that I would use this in public is crazy. Is this the Anker stand? 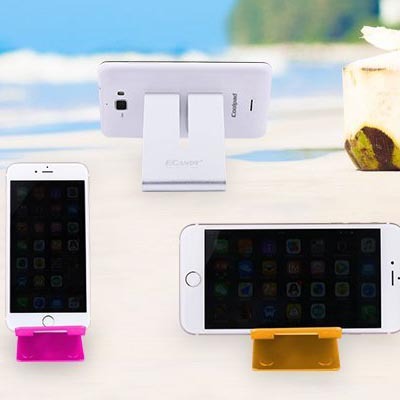 This looks just like the Anker stand. This is getting sort of ridiculous now. Actually when you put them side by side you’ll see that they are very different, but in isolation I would be mixing them up all the time. Anyway, this stand has a lot of the same positives as the Anker from a design perspective, but since it has a cutout that the Anker lacks it is actually easier to do good cable management when charging your tablet. They are so similar though. From a functionality point of view I have to give it to the TaoTronics. It is so cheap though, you could buy both and then just get rid of the one you like least. Oh, ho, ho – Pasonomi, you sly devils. Now owners of the 12-inch iPad Pro can briefly fool people into thinking they have (another) iMac. This stand design is clearly inspired by Apple’s popular all-in-one computer. I like it a lot. 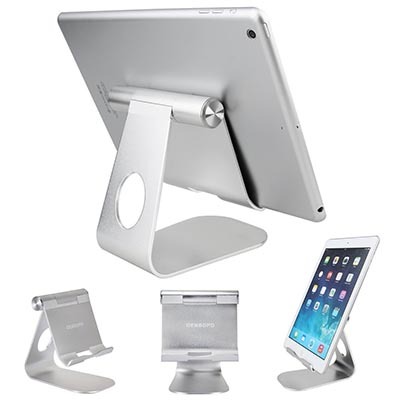 It has a solid, simple design with an angle-adjustable holder to accommodate both portrait and landscape viewing. Of course, since it is designed to work with the big iPad, your iPad Air will be just fine. This is a great choice at a great price. This has a very similar design to the Pasonomi, but if you just spend a second looking at both you’ll realize that they are different products. Of the two, the Pasonomi is definitely more attractive to me. This is also much smaller and I would not put a big tablet on it. The manufacturer suggests an iPad Mini. Other than that there is nothing special about this stand. Get it if the Pasonomi is too large for your tastes or needs but you still want the whole iMac vibe. Now this is a pretty innovative idea. 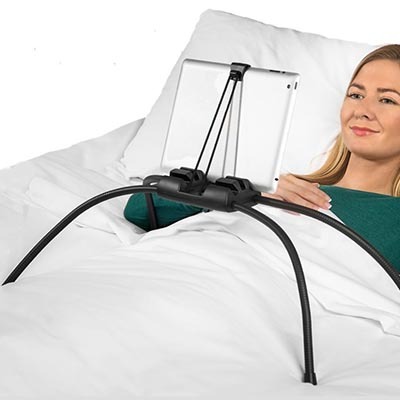 It’s a stand that has bendy legs like a Gorillapod, so you can use it on sofas or a bed. It is not the most elegant or attractive of designs, but it does seem to work, which is the most important thing, I guess. It’s not priced too badly, and if you have a specific use for it I think it is a good buy.